Does the EZPZ Happy Mat Really Work? Getting the kids through the messy stage of eating is something that can be a little difficult. After all it can be hard for little fingers to handle their forks and spoons and keep the plate from slipping too. A good solution for this may be the EZPZ Happy Mat. 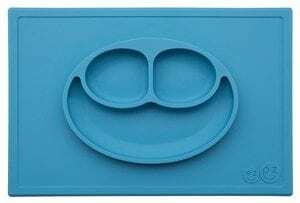 The EZPZ Happy Mat is a one piece silicone placemat. It is a placemat that has the plate shaped right into it. The promoters of the EZPZ Happy Mat say that it helps to contain all the mess. Which just by looking at it one can tell that’s it really is designed to do this. Then in has suction cups which helps to keep the entire mat in place. What makes it extra special is the plate section is designed like a Happy Face. It is dishwasher and microwave safe. The hype really does focus around every feature of the EZPZ Happy Mat. The convenience of using this is really what makes it extra special. Not to mention how appealing it is to the kids. The cost for the EZPZ Happy Mat is $24.99. There is no above the norm commitment for you as the parent to use the EZPZ Happy Mat for presenting food to your little one. It is highly unlikely that you will have to convince the young one to make use of this EZPZ Happy Mat. It really is fun for them. Overall the EZPZ Happy Mat is a great idea. For those that have a little one that they go through feeding time with, they can instantly recognize the value of the EZPZ Happy Mat. Some little ones think it is a game to pick up their bowls and fling them. Then others prefer to each right off the highchair tray. Messy or what! The EZPZ Happy Mat is a great tool for making the transition from highchair to table. Parents can remove the tray and push the highchair up to the table. Then they can put the EZPZ Happy Mat onto the table making sure it is suctioned into place. It can’t get any easier than this. The plate section is divided into three sections so the little ones feel like they are eating off of a plate like the others are doing. Their food isn’t all mushed together like it is when served in a bowl. We are definitely going to give the EZPZ Happy Mat a thumbs up. By doing so we are joining the majority of others who have reviewed the EZPZ Happy Mat with some positive remarks. Out of 1,533 reviews it has received a 4.5 rating. The biggest complaint is when the little one happens to life up the edge of the EZPZ Happy Mat and then flips it over. Aside from this there doesn’t seem to be much to complain about. If you are looking for something else that can be really beneficial to have around the home, check out the Ella’s Clear Corner Protectors. This helps to protect the little ones from sharp furniture edges. What do you think? Does EZPZ Happy Mat work or not? Does Fuel Shark Really Work? Does Flex Seal Brite Really Work? Does the Instant Pot 7 in 1 Pressure Cooker Really Work?